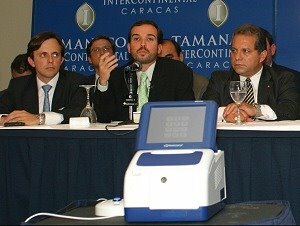 Juan Cristóbal says: – Alek Boyd sends us this link about Smartmatic’s latest “business ventures.” It appears our friends with the magical machines have been hired to provide support for the Phillipine elections. Funny, I would have thought President Gloria Macapagal-Arroyo would have been like the anti-Chávez, what with the chumminess between her and George W. Bush. But it turns out some people think she’s the closest thing we have in this crazy world to a female dictator. And get this, her father’s name was Diosdado. Post 31 out of 100…thanks Alek.